We help enable better policy, regulatory, refining and logistics decisions at the regional, national and international level using our unique, integrated WORLD (World Oil Refining and Logistics Demand) modeling approach. 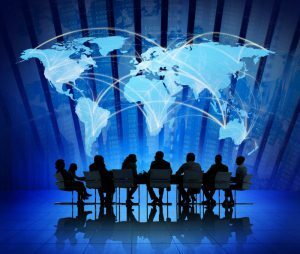 WORLD’s ability to capture the interactions among supply, demand, regulatory, fuels, logistics, trade and refining and between global regions has led to a 30-year track record of successful application to high profile questions/developments. These analyses range from world/regional investment and trade outlooks, to market implications of alternative logistics and crude exports scenarios, to assessments of land, aviation and marine fuels regulations, global catalyst markets and carbon regimes. Contact us today at info@ensysenergy.com or 781-274-8454 to discuss how our expertise can support your strategic or regulatory decisions. 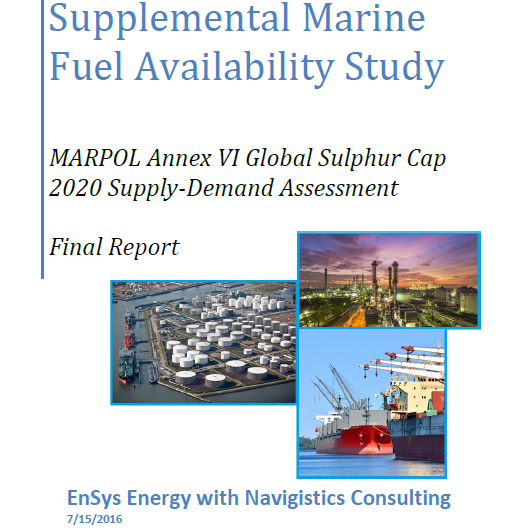 In 2016, EnSys and marine partner Navigistics undertook a WORLD-based assessment of the impacts of the IMO MARPOL Annex VI Sulphur Cap. This Supplemental Marine Fuel Availability Study was submitted to the IMO and presented by the authors at MEPC70 in October 2016 when the IMO settled on January 1st 2020 as the implementation date for the Rule. The study was sponsored by IPIECA, BIMCO, Concawe/Fuels Europe, Canadian Fuels Association and the Petroleum Association of Japan. The comprehensive study covered marine fuel and scrubber penetration outlook for 2020. Then EnSys used the WORLD Model® to project the effects on 2020 refining and markets of super-imposing the Sulphur Cap Rule. In a ‘classic’ demonstration of the power of the WORLD approach, EnSys first calibrated against 2015 data then simulated 2020 first without and then with the Rule. This led to the finding that 2020 without the Rule would be a relatively ‘normal’ year in terms of market economics and differentials but that superimposing the Rule would create severely strained markets, calling into question the ability of the refining industry to supply the full 4+/- million bpd of 0.5% sulfur fuel that would need to be switched from high sulfur to achieve 100% compliance. EnSys was able to generate detailed projections of the impacts on refinery operations, on marine fuels blends and on market economics: crude and product regional ‘supply costs’ and refining margins. The study pointed very clearly to the strains in 2020 that are now becoming more widely accepted as potentially impacting all crudes and products in all regions. By substituting in unrealistically high maximum utilization rates for refinery units worldwide, EnSys was also able to demonstrate the key failing in the official IMO study which assumed refineries worldwide would all be able to operate close to ‘nameplate’ thus thus concluding that even the highest level of ‘switch volume’ could be readily handled by the global refining system. EnSys and Navigistics continue to offer leading-edge ‘2020’ services and assessment as this massive ‘sea-change’ for refining and shipping moves closer. These include close tracking of IMO developments, scrubber penetration and updated WORLD Model® global refining/market outlooks. In late 2017, EnSys undertook of thorough assessment of the prospects for Western Canadian heavy crude for the senior management of a large logistics entity. Our research covered production cost trends, impacts of carbon regimes and novel technologies. WORLD was used to generate FOB value projections for a range of WCSB crude grades through 2030 under different scenarios. The 2018 OPEC World Oil Outlook is to be published in late September. EnSys has participated in the production of the Downstream Section of each Outlook since 2007 and predecessor reports since 2000. The medium term outlook compares incremental refining capacity by region to incremental demand. The long term outlook is under-pinned by WORLD Model® projections to 2040 for refining activity and investment, crude and product trade and economics. EnSys has undertaken a series of analyses to support the Departments of Energy and State on issues relating to the Keystone XL pipeline. In 2010, EnSys conducted an evaluation of the impacts on U.S. and global refining, trade, and oil markets of the Keystone XL pipeline project to bring additional Canadian crudes, including oil sands, into the United States. 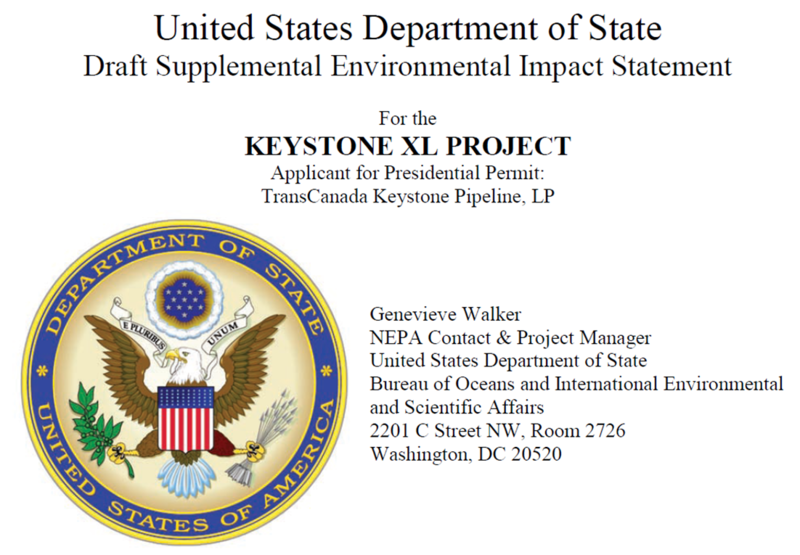 For this first study (“Keystone XL Assessment”) EnSys employed its WORLD model to address the potential impact on refining activities, crude slates, investments, margins and CO2 emissions, crude and product trade, and import dependency and supply costs under several pipeline scenarios centered on constructing or not constructing Keystone XL and/or other potential key pipelines. The model provided integrated analysis and projection of the global petroleum industry, combining top-down scenarios for projected oil price/supply and demand over the next 20 years with bottom-up detail on crude oils, biofuels, NGLs, refining operations, CO2 emissions and costs, transportation, product demand and quality. In a 2011 “No Expansion Update”, EnSys was asked to examine in more depth a scenario where the Keystone XL pipeline and other major projects do not go ahead. In this study, EnSys and marine specialist Navigistics prepared a detailed evaluation of the potential for modifications to existing pipelines plus new rail, barge and tanker routes to ship western Canadian crude in the absence of major pipeline expansions. What this analysis projected – major growth in crude-by-rail plus extensive use of existing pipelines and rights of way as the basis for expansion – is to a large degree what has played out in the market. In a third study performed at the end of 2013, EnSys was requested to examine petroleum market changes since the 2011 Final EIS and whether these altered the original conclusions. Changes took into account increases in domestic crude oil production, decreases in expected demand, and changes in infrastructure, particularly the increase in oil transport by rail. Again, this was a WORLD–based study that examined a range of scenarios. Incorporated as an appendix volume in the Department of State FSEIS, this market analysis provided quantitative projections of crude flows, refining and market impacts across Reference, High Resource, Low/No Net Imports and High Latin American Supply scenarios. 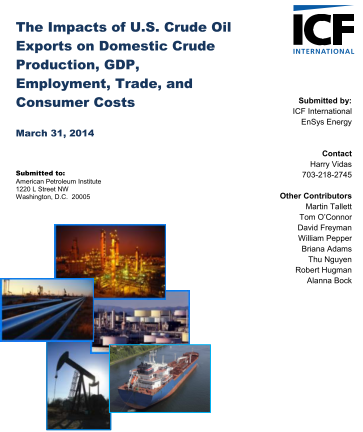 In 2014, the API released the study “The Impacts of U.S. Crude Oil Exports on Domestic Crude Production, GDP, Employment, Trade, and Consumer Costs” prepared by ICF International and EnSys Energy. By employing econometric modeling in conjunction with global supply demand projections and the WORLD Model, ICF and EnSys were able to assess both industry and economy impacts allowing for the “feedback” effects of price elasticities and other factors. The study shows that exports of crude oil would have significant impacts on both the US economy and industry trade patterns and economics. Allowing exports could create up to 300,000 additional U.S. jobs in 2020 and shave billions off fuel costs for consumers. EnSys WORLD Model analyses correctly projected – as has happened – that WTI-Brent differentials would narrow sharply, with or without crude exports, because of the build-out in pipeline and rail crude transport infrastructure. WORLD modeling also projected crude exports growing to and potentially exceeding 2 million bpd but in the form largely of enabling a swap trade whereby exports of the lightest crudes and condensates – as is happening to Canada and elsewhere – would be partially offset by continued imports of heavier, sourer crudes better matched to US refineries. As the WORLD modeling also demonstrated, allowing crude exports would avoid the need for US refineries to operate and invest non-optimally to process very light crudes and condensates. Such non-optimal operation was shown to force up costs to produce gasoline while allowing crude exports would have the opposite effect. EnSys’ World Oil Refining Logistics and Demand (WORLD) Model® is utilized by EnSys for strategic, regulatory and other assessments. The Model extends analytical boundaries by bringing the key parameters of the downstream into one system. The WORLD Model® is highly flexible, with the ability to model short, medium, and long-term forecasts. WORLD captures and simulates the global and interlinked nature of the present and future petroleum industry, providing projections for global refining activity, investments, margins, and utilizations, crude and product flows, and pricing/differentials across alternative scenarios.